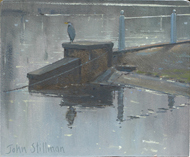 [mine] creative space and art gallery is delighted to be presenting The Paintings of John Stillman solo exhibition and book launch. and features a selection of over 100 paintings with accompanying text by John and a foreword by Trevor Chamberlain ROI RSMA. 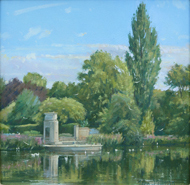 John Stillman is a well known Surrey artist. 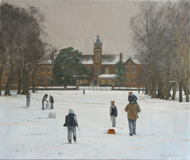 Born in Carshalton in 1968, he is completely self taught and has been drawing and painting since a very young age. Before becoming a professional artist in 2006, John worked as a book illustrator and then as a graphic artist for over ten years in the advertising industry in London. 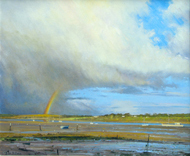 John’s paintings capture the delicacy and beauty of light and atmosphere across a wide range of subjects including landscapes of Surrey and scenes from around the River Thames, which he paints alongside fellow members of the prestigious Wapping Group of Artists, to which he was elected a full member in 2009. 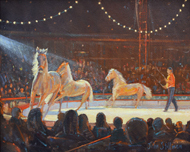 John also enjoys capturing the unique atmosphere of events such as a day at the Epsom races, the excitement of fireworks on bonfire night, the thrill of sledging on a cold winters day or the spectacle of a trip to the circus. 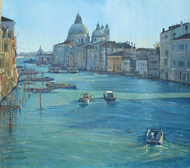 John has held many successful solo exhibitions and his paintings have featured in group and open exhibitions including The Royal Society of Marine Artists and The Royal Institute of Oil Painters at the Mall Galleries in London. 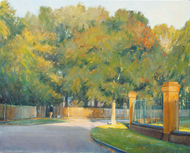 He has also had his paintings exhibited at The Royal Academy Summer Exhibitions. 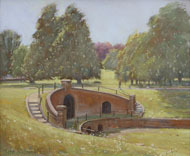 In addition to the Wapping Group, John sits on the council of the Chelsea Art Society and is a member of the Croydon Art Society. His paintings are held in numerous private collections in the United Kingdom, France, the United States of America and Australia. For more information about John's solo show and book please contact Andrew at [mine] art gallery on 020 8647 1800 or 07989 851 377.